How To Know Whether Your German Shepherd Dog is Ill? If you are reading this post it means you already have a dog or planning to have one or may be some way connected to dogs. If you already have a dog or if you are looking forward to adopt one this post will help you become a better owner. Signs of illness in dogs are the topics of discussion here. A strong power observation needs to be developed to understand when actually your German Shepherd's health demands your attention, and it depends on how efficiently you can identify the signs of illness that are holding back his happiness and smoothness of life. The more you observe your GSD, the more you are going to learn about him. The better you know him, the owner you can become, and in turn your observation power will automatically be enhanced. Smelly ears: Smelly and waxy ears is a significant sign of illness. Dry and rough coat: Heavy internal parasitic infestation and weak internal health adversely affect the coat condition. Skin rash and patches on the skin: Internal parasite also adversely affects the skin condition. Bacterial problem, allergies and mal-nutrition causes different type of dermal problems. 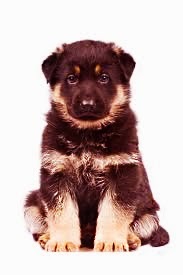 Here is how to do diet management for your German Shepherd puppy. Bleeding gum: Accumulation of tartar can cause pyorrhea and bleeding gum. Lethargy: Lethargy can caused by many problems, including insufficient diet, un-balanced diet or shortage of essential minerals and vitamins. These may sound like just some basic signs of illness, but may be lead to serious health concerns if not treated at the earliest. Your dog may show other indications that may lead to even serious situations. Sudden Loss of Appetite: As long as your German Shepherd is taking his usual diet normally, he is okay. Sudden loss of appetite may be the result of one or more health problems, starting from indigestion, irritation and pain to more serious issues that may need immediate attention. Dogs usually love food – especially his normal diet. Any deviation in the general affinity towards his food should be an alarm for you to call your vet. Increase or Decrease in General Intake of Water: Dogs usually drink less compared to humans and this is normal. If your German Shepherd suddenly starts drinking more or less than what he usually intakes, you should be more attentive, and probably it’s the time for you to give a call to your vet. Serious health issues like pyometra in females, kidney problems, stomach problem and dehydration etc. may cause your dog to drink unusually less or more. Stained urine: Stained urine is an indication of kidney problem. If stained urination is accompanied with burning pain it indicates that your dog may be having Urinary Tract Infection. Stone in urinary tract also leads to painful and stained urine. Frequently Vomiting: Frequent vomiting is an indication of fragile gastro-intestinal health. Blood vomiting should be considered too seriously and may indicate many fatal ailments. Frequent and repetitive vomiting with change in the color of stool should not be overlooked. May be you need to spare a thought over your dog's daily diet. Here is the science of food and nutrition for your GSD. Distressful Breathing: Distressful breathing is an indication of many internal health problems, most common of which are respiratory tract infection - RTI, cardiac problem, lungs problem etc. Sudden imbalance of essential minerals and certain blood components may lead to many serious health issues and may start with distress breathing. Decrease in hemoglobin level also leads to distressed breathing. Presence of heart and lungs worms also leads to distressed breathing. Change in Behavior: We cannot overlook the behavioral aspect. Any kind of physical irritation and pain is reflected through unnatural behavior in your dog. Behavioral signs like unpredictable aggression, restlessness, decreased tolerance level, lack of patience, lethargy, facing problem to stand from sitting, disoriented locomotion, staying overly aloof are some of the signs of physical displeasure. Repeating… a powerful observing capability will make you more efficient as a dog owner. Keeping a dog is a big responsibility that many of us have shouldered knowingly and consciously. It’s just the awareness and knowledge that make you better as a dog owner than others. All kind of physical displeasure in your dog – be it serious or trivial are reflected differently, either through prominent or subtle change in behavior, or through other sings. Hope this piece will help you. Please feel free to share your experiences through commenting.